I am currently not available for any projects. 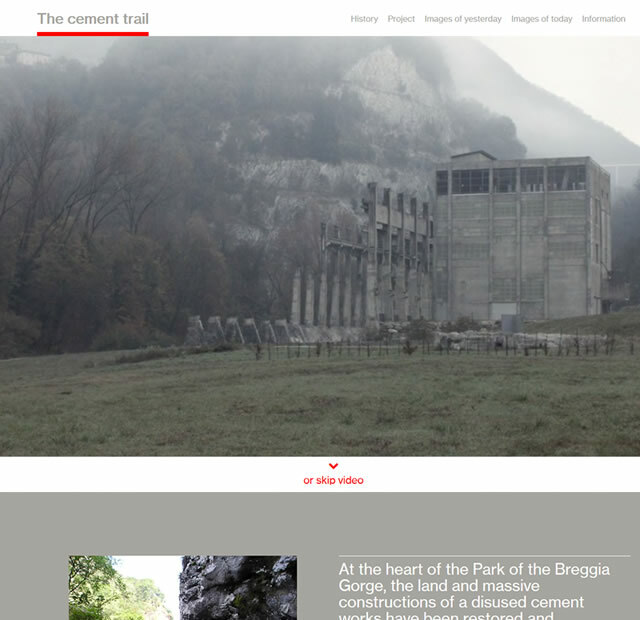 At the heart of the Park of the Breggia Gorge (Parco delle Gole della Breggia), the land and massive constructions of a disused cement works have been restored and restructured as part of a unique territorial and cultural project: the “Cement trail”. The online information for this trail was completely integrated into the parc’s website. To increase findability and visibility and to generally give more importance to the trail, a new, unique, stand-alone website was to be created for it. CCRZ, an internationally reputed and award wining local design consultancy with interdisciplinary competences, took care of the whole branding and graphic design of the project. They asked for my expertise for the technical conversion of the design into and implementation of a functional website. This website describes the trail’s past, present and future in words and pictures. It is responsive and available in four languages: Italian, English, German and French. iamwebdeveloper.com is a product by Nico De Backer S.a.g.l.